Historically in the United States, there has been little concern about the needs of incarcerated women and their family members, especially children. This began to change with the tremendous increase in the number of incarcerated women. The rate of women’s incarceration increased dramatically during the 1980s and today the number of female inmates continues to rise faster than the number of male inmates. In 1986, 19,812 women were incarcerated in the United States and this number rose in 1991 to 38,796. Today, over 112,000 women are incarcerated in state or federal facilities (Sabol et al., 2007; Snell 1994). While in 1995 women comprised 6.1% of the prison population, women currently make up 7.2% (Sabol et al., 2007). 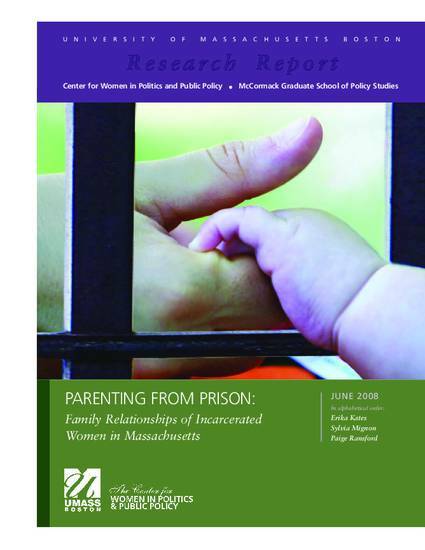 This report will review the literature on incarcerated women with a particular emphasis on family relationships, provide an overview of incarcerated women in Massachusetts and their family ties, and specifically focus on mothers’ concerns for their children. It will offer a review of “innovative practices” in the field and offer recommendations for improving the care of women in correctional facilities in Massachusetts with regard to women’s family connections. The overall goal of the project is to identify existing needs, resources and challenges related to the development and maintenance of contact between incarcerated women in Massachusetts and members of their families, especially children. Research Report. Boston: Center for Women in Politics and Public Policy, McCormack Graduate School, University of Massachusetts Boston.